Delta has announced that it is going to tighten its standards for allowing people to fly with “comfort animals.” Speaking as a frequent business traveler who recently saw a dog take a dump right in the middle of the concourse of the Fort Lauderdale/Hollywood airport — which faces a lot of other challenges, including being, consistently, one of the most crowded and unpleasant airports around — I applaud Delta’s stand. Delta believes that the influx of “comfort animals” is getting out of hand, and reports that there have been incidents in which the animals have exhibited aggressive behavior, including growling and biting, have fouled airport terminals like the incident I witnessed, and have even attacked a passenger. The Delta statement also said that passengers “have attempted to fly with comfort turkeys, gliding possums known as sugar gliders [pictured above], snakes, spiders and more.” Now Delta will require that passengers seeking to bring animals on board present evidence of the animals’ good health and vaccinations, sign a document confirming that their animals can behave in a closed airplane cabin, and presumably demonstrate that they really need to have the animals board the plane with them in the first place. I’ve got no problem, of course, with visually impaired people using guide dogs, which are always well behaved, but I agree with another statement that Delta made: “Ignoring the true intent of existing rules governing the transport of service and support animals can be a disservice to customers who have real and documented needs.” The reality is that people are pushing the envelope with their animals, just as people are pushing the envelope in claiming “disabilities” that entitle them to board before the rest of us. Anyone who has traveled much recently has seen the explosion of animals in airports, and I’m confident that most people have witnessed unpleasant incidents like the one I saw, or had to endure barking dogs while waiting for a delayed plane, or watched two “comfort” dogs growling at each other at a gate. I’m a big fan of dogs, but they really don’t belong in airports, or in the passenger compartments of airplanes. And that goes double for “comfort turkeys,” gliding possums, spiders, snakes, and the rest of the modern airport zoo. A New York state appeals court has rejected a request to issue a writ of habeas corpus to free two chimpanzees who are kept in cages — one in a warehouse in Gloversville, New York, and the other in a storefront in Niagara Falls, New York. The writ sought to have the primates moved from their cages to an animal sanctuary. In the case, the New York courts were presented with expert evidence “that chimpanzees exhibit many of the same social, cognitive and linguistic capabilities as humans and therefore should be afforded some of the same fundamental rights as humans.” In a nutshell, however, the court of appeals concluded — correctly, in my view — that the fact that chimpanzees exhibit some humanlike characteristics is simply not enough to make them “persons” in the eyes of the law. The court reasoned that “[t]he asserted cognitive and linguistic capabilities of chimpanzees do not translate to a chimpanzee’s capacity or ability, like humans, to bear legal duties, or to be held legally accountable for their actions.” And, the court added, the flip side of personhood would mean that chimpanzees could be held criminally accountable for killing or injuring humans — something that has not been done, obviously, because chimpanzees do not have moral culpability for such acts, nor do they have the capacity to understand the proceedings against then or to assist in their own defense, which is what courts typically look for in deciding whether a defendant is competent. At some point, we need to ask ourselves — do creatures that exhibit these kinds of qualities and characteristics really deserve to be put into cages at the whim of whoever purchases them? 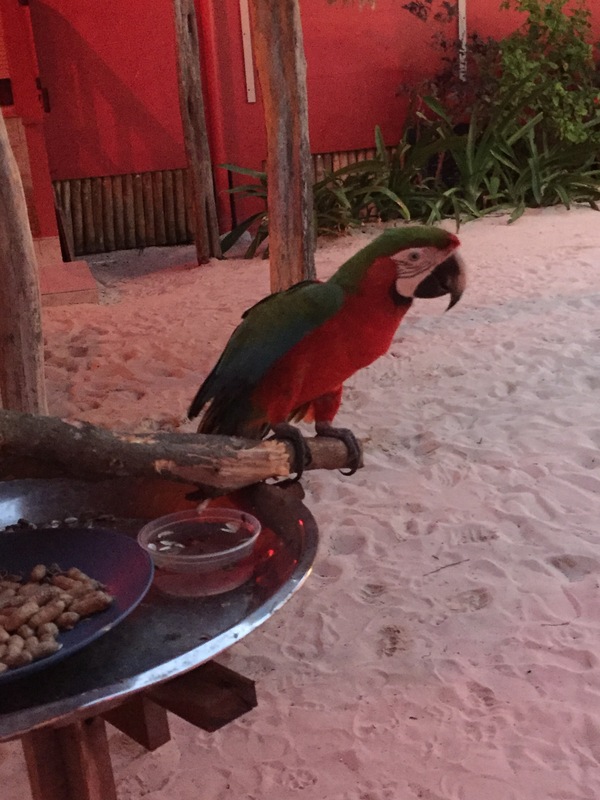 Last night we went to a seaside bistro that featured a parrot to give the bar area a distinctive, tropical, piratical feel. It was a beautiful bird, large and colorful, with that kind of wise look around the eyes that parrots always seem to have. I felt sorry for that beautiful bird. I’m sure it would rather be back in its nest in the jungle, but its wings were clipped, and it was confined to its perch with only a dish of peanuts before it. Worst of all, some old guy was constantly in its face, repeating the same annoying whistle, over and over and over again, in hopes that the bird would imitate it. But the bird didn’t. It squawked and flapped and, I think, tried to ignore the guy. Maybe the bird was just not interested, but I preferred to think that the bird was knowingly refusing to be some cheap entertainment for a boozy codger in a ball cap. I’d like to think that parrots have pride, even in what must seem like parrot purgatory. With an abundance of trees, and lots of fences that serve as de facto elevated highways, the backyards in our German Village neighborhood are a squirrel’s paradise. You see the bushy-tailed rodents scampering up and down trees, leaping from branch to branch, munching on nuts, and generally enjoying lives that seem like one big frolic. And when one of the neighbors puts out fresh carrots for squirrels to enjoy, so much the better! This little guy attacked a carrot that was about as long as he was with evident and territorial relish. 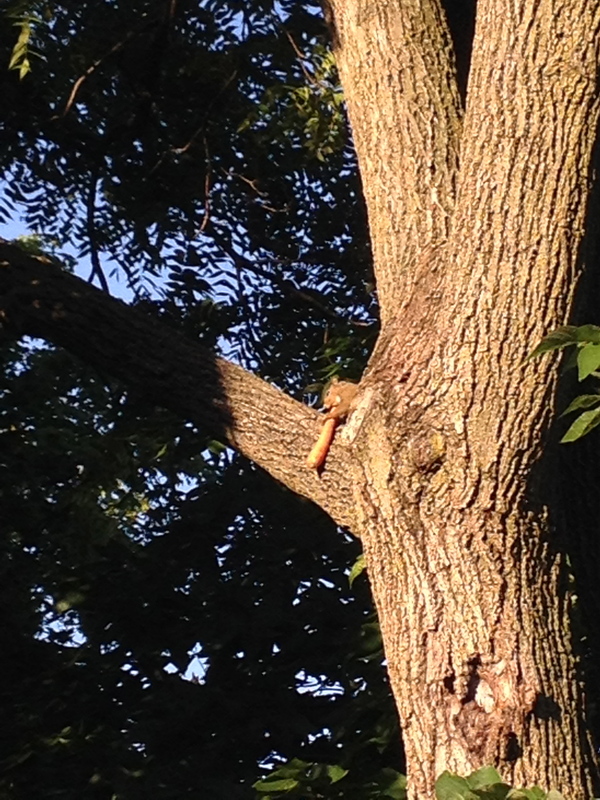 Apparently, squirrels really like carrots. On the home stretch of this morning’s walk, as I moved along a section of Route 62 where there are woods on both sides of the road, two deer stood on the pavement while a car approached. Fortunately, they crossed over without incident, and the car slid by. Normally the deer would promptly vanish into the trees. This time, though, the female stood, framed in the glow of a street light, and stared at me, her primal black eyes glittering in the lamplight. It was unnerving — and suddenly I felt all of my senses on high alert, providing the kind of acute awareness of my surroundings not felt since I was in a movie theater with a high school date, conscious of every movement she made and trying to figure out whether they meant that she was receptive to holding hands. The deer wasn’t watching to admire my walking form. The only logical conclusion was a fawn was still on my side of the road, and the mother deer was waiting and watching to make sure they were reunited. If so, that meant I needed to get out of the area without confronting Bambi, or the two deer might come down on me in an unpleasant New Albany version of When Animals Attack. So I listened carefully, sniffed the air and smelled the lingering musky odor of the two deer that had passed, kept one eye out for the mother and the other for the child, and kept moving ahead at a steady pace. The mother watched me the whole way. My primitive senses aren’t very sharp, because I never saw the fawn, but after I passed I turned back to see what was happening. Sure enough, the mother crossed the road again, and a small deer emerged from hiding right where I had passed. The mother sensed my presence and turned and stared at me again with those intense, wild eyes. I decided it was wise to move along.